The shuttle is ready to launch in LEGO City and everyone is watching. The crew have made their final preparations and the shuttle is fuelled up for a wonderful adventure. Countdown commences and everyone looks to the sky to see the boosters fall off. In space, the crew begin their jobs, helping a satellite and preparing to dock at the space station. All that work and those on board need a little down time. Neo loves LEGO and this Level 1 book allowed him to take the reading lead. He continues to amaze when it comes to deciphering words and concepts. I am 'over the moon' pleased! With the NASA space shuttle program coming to an end, this book will be for children a reminder of what once was. This is a great book in the Lego City series from Scholastic. It is also one of the Level readers. 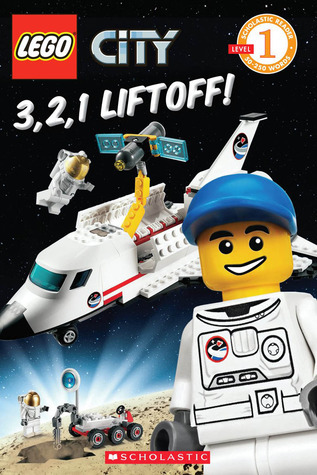 From prepping the ship to working on the space station, this book is illustrated with bright vibrant colors, and most of the scenes are drawings of actual Lego projects that you could create and do. It is a wonderful addition to the Lego City series of books.The Leveled readers from Scholastic are a great way to introduce your child to reading. The levels are:Pre1: ABC's & First WordsLevel 1: Sight words, words to sound out and simple sentences.Level 2: New vocabulary and longer sentences.Level 3: Reading for inspiration and information.Each book has a level rating, a grade level, a reading level, a lexile level and a word count on the back.Read the review and with links to other reviews of Lego City books on my blog Book Reviews and More. A book my 6 yr old loved, a little old for my preschoolers. A solid reading level 1 book, this reader has a good amount of advanced vocabulary words, but not so long that it discourages a new reader. Used it for his read out loud book, which was perfect. It took about 5 mins for him to read and had just enough new vocabulary words to make it challenging. Also, it was a fun and interesting story he could get into. He liked it so much, he asked for more by this author. Great reading book! Gets an extra star for being the only Lego City book that doesn't read like an advertisement for the sets. The boychild is addicted to legos, so these are among his current favs. I figure we'll be able to use it to show how astronauts used to go into space. Looking forward to the Space X version. Very very simple, but that's the point. Easy, clear words for beginning readers and a really great format and nice pictures to keep the kids interested. This is a level 1 reader helping teach the basics of space flight and astronauts to younger readers. Bought this for Gavin. He loves Legos and space, so this is a favorite book. He's always looking through this one. Awesome for my budding reader and Lego fan! Pretty good little book for new readers. Another great book in the series for our little one who is starting to read.